During Boston’s glorious 2013 regular season, Clay Buchholz almost accomplished something no other Red Sox starting pitcher had ever done, finish a season undefeated with ten or more decisions. He got to the end of September with an 11-0 record before losing to the Blue Jays in his next-to-last regular season start. Remember Kason Gabbard? If you’re a Red Sox fan, its the sort of name you can’t easily forget. 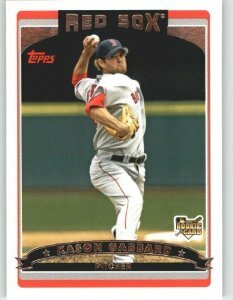 Gabbard, a big left-hander from Oxford, Ohio, who had been drafted by Boston in the 29th round of the 2000 draft, is the last starter to win all of his Red Sox decisions in a single season. In 2007, he started seven times for Terry Francona’s ball club and won all four of his decisions before getting dealt to the Rangers at the trading deadline in the deal that brought closer Eric Gagne to Boston. Gabbard was just 25-years-old at the time and he seemed to have a very decent shot at securing a permanent spot in Francona’s rotation. One of his four victories was a complete game shutout and his ERA was an outstanding 2.97 before making his final start as a Red Sox. In that start, he got shelled by the Indians in a game Boston went on to win 14-9. That poor outing might have been the trigger that convinced the front office folks at Fenway to deal him. He ended up winning two of his three decisions with Texas during the second half of the season, but only because he was the recipient of tremendous run support. His ERA as a Ranger that half-year was an unimpressive 5.58. Texas gave him one more shot to make their rotation the following year but he wasn’t successful. He spent the next two years in the minors and then retired. Also born on this date was former Tiger slugging first baseman Charley Maxwell, who started his big league career as a Red Sox prospect, back in 1950.